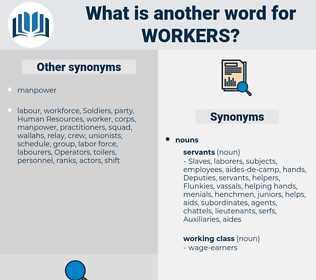 What is another word for workers? dockworkers, co-workers, laborers, homeworkers, shiftworkers, MINERS, technicians, staffers, clerks, dockers, farmers, supporters, loggers, janitors, Functionaries, attendants, seafarers, paralegals, harvesters, facilitators, machinists, searchers, helpers, Diggers, Fishermen, assistant, Craftsmen, earners, MAIDS, artisans, people, guides, women, employees, trabajadores. teachers, managers, representatives, stakeholders, Administrators, presenters, journalists, responders, operations, allowances, Specialists, intervenants, receivers, providers, gender, partners, players, intervenors, enterprise, services, Resources, interveners, citizens, people, committee, accidents, attendees, unions, HCWS, grounds, trades, FDHS, Agencies, wizards, forces, men, Industries, Les, actives, Activities, aids, aliens, crafts, tasks, Injuries, actors, hazards. women, protection, proceedings, directive, implementing, Hires, actors, female, des, health, engaged, market, hazards, sls, MSM, table, focal, Of, lands, flight, march, ld, account, 84, working. owners, brokers, reporters, offers, engineers, Researchers, Investigators, Lawyers, seekers, teachers, supervisors, overseers, Promoters, whistle-blowers, developers, professionnels, managers, representatives, stakeholders, Administrators, technologists, drivers, entrepreneurs, speakers, writers, lecturers, conditions, unemployed, professions, designers, presenters, journalists, tradespersons, producers, responders, couriers, organisations, travailleuses, provisions, travellers, contractors, operations, years, builders, operatives, authorities, allowances, Specialists, foreigners, OFWS, traders, participants, volunteers, wages, suppliers, advocates, scientists, compensation, Nurses, collaborators, CREWS, providers, proponents, politicians, immigrants, colleagues, activists, personnes, passengers, handlers, werknemers, powers, rescuers, partners, Regulations, unemployment, residents, Personalities, Migrants, Factories, W, Organizations, defenders, computers, trainees, presentations, players, businessmen, recipients, communicators, perpetrators, intervenors, candidates, users, Efforts, Mentors, earnings, ouvriers, solidarity, mechanics, experts, e, Friends, frameworks, boomers, executives, weeks, Respondents, commuters, services, associates, individuals, humanitarian, applicants, holders, factors, insiders, Resources, enterprises, L, contributions, delegates, Refugees, redundancies, fishers, Strikes, Measures, contributors, informants, animators, personages, provinces, custodians, prevention, interveners, programmes, crossers, hours, Carriers, guardians, Salaries, scholars, times, Students, entrants, citizens, sources, champions, others, Adolescents, inmates, troops, conclusions, courses, aides, militants, panellists, contracts, Females, juveniles, visitors, competences, social, commissions, competencies, claimants, leaders, recruits, issues, contingents, moderators, accidents, losses, artists, peoples, Categories, minors, envoys, Families, regimes, uses, Rights, Areas, counterparts, pathogens, NGOS, departments, attendees, victims, Associations, brakes, technologies, cadres, discussants, police, Undertakings, unions, committees, HCWS, FDWS, Children, skills, carers, authors, bulletin, elements, NATIONALS, Auxiliaries, sponsors, points, trades, flexible, exists, Males, FDHS, terms, Agencies, wizard, wizards, homes, forces, findings, men, Industries, systems, notes, components, schemes, ranks, fields, assets, groups, sectors, seminars, teams, Communities, grades, plans, payments, awards, Donors, positions, functions, practices, items, offices, Ones, tools, actives, Activities, demands, Firms, Plants, Exercises, Talents, ministries, aids, interests, humans, levels, -rrb-, Los, Pupils, aliens, Entities, crafts, changes, chambers, tasks, hosts, series, Companies, actions, crashes, guys, Programs, Injuries, ", posts, cases, names, numbers, Gains, uniforms, Iraqis, figures, deaths, days, Houses, Parties, 1998, hands, Classes, Lives, Studies, passes, 2006, councils, 2004, 1956, data, SAUDIS, S, Bodies, states, goods, sheds, proceedings, Hires, actors, hazards. clerks, helpers, staffs, Guards, benefits, servants, work. 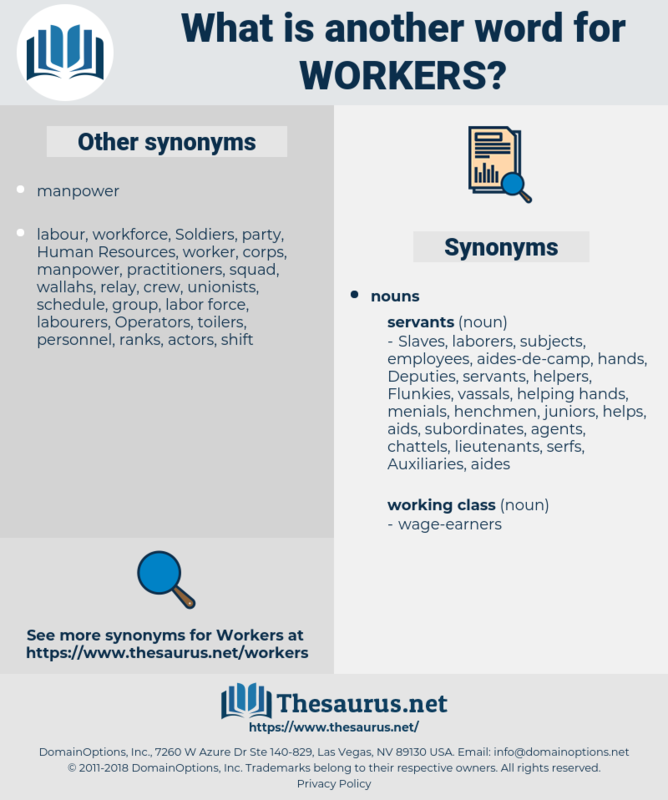 manpower, servants, work, workforce, trabajadores. workforces, professional, labours, makers, Caregivers, educators, wage-earners, assistance, labors, staffs, Ambulances, layoffs, Guards, benefits, Businesses, manpower, servants, work. The workers had their little families - husband, wife and children. Conditions may be above the standard, and the workers may protest violently.